Haidt is a social psychologist and professor at NYU who first caught my attention several years ago when I heard an NPR interview. It was one of those interviews that caused me to find an exit, pull into a parking lot and write down his name so I could learn more. Moral Foundations So why do liberals and conservatives see the world so differently? It turns out every person and culture holds deep moral values that combine to form a person’s understanding of what it means to be righteous. The five most foundational moral value systems are: care for others, fairness/justice, loyalty to one’s group, respect for authority, and purity. It turns out that conservatives hold these five about equally while liberals value care and fairness more than the others. 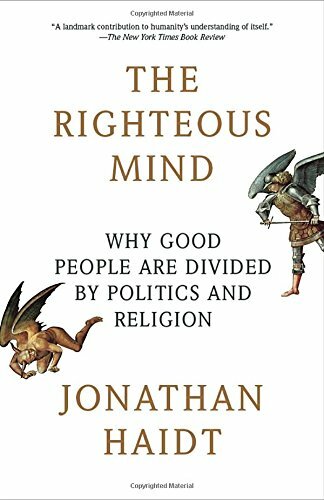 This is the topic of his book The Righteous Mind: Why Good People Are Divided by Politics. Cuddled Collegians Haidt’s cover article for The Atlantic last year expressed the wide concern many people have for lack of diversity allowed on college campuses. College students who’ve been taught to stand against any form of oppression are now oppressing and shutting down campus speakers whom the students deem to be out of bounds. At the same time, professors are required to walk on proverbial eggshells in order to avoid offending students who are considered emotionally vulnerable. I like people who recognize their own perspective biases and then try to step outside of those biases to not only see the world more clearly but also see themselves, their tribe and their own biases more clearly. Haidt is, by all accounts, a secular liberal; however he is quite critical of wider liberalism for not being true to its own values. He’s also able to give fair critique to other worldviews while not demonizing them based on his own biases. It think we need not only more of what Haidt finds via his research and writing, but more of who he is and how he goes about being in the world. May others say the same for each of us.